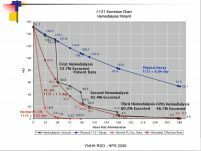 This powerpoint presentation was given at the HPS 2006 Annual Meeting and discusses the radiation safety and dosimetry issues encountered when administering I-131 therapy to dialysis patients. Three case histories are presented showing the excretion kinetics and their effects on whole body dose. Both peritoneal and hemodialysis patient cases are discussed. The presentation also suggests ways to model prospectively the post-Rx dialysis schedule and the resultant excretion kinetics to lower the administered dose to control whole body dose.